Control panel manufacturers produce assembled electrical control panels. Many customers want them with a UL 508A safety certification label so companies will become UL 508A certified in order to provide it. There are ~5,000 companies with UL 508A certification. They range in size from small garage shops all the way up to divisions of large corporations so there’s a large diverse pool of safety certified companies to choose from. Beyond safety certification knowledge and capability is what makes each control panel manufacturer different. If you’re looking for a new one consider important factors like their type and market focus. Most electrical control panel manufacturers fall into one of five basic types. Each type has a different business focus so if you’re looking for a new one choose the right type for your business. Choose one that specializes in providing what you want and the level of service you want. Their primary business is producing control panels. They don’t sell parts so they’re not in competition with parts distributors. They don’t install control panels so they’re not in competition with electrical contractors. They don’t provide integration services so they’re not in competition with control system integrators. They understand how these supporting businesses work, but aren’t interested in performing their functions. ADVANTAGES – Good ones understand control applications, control panel production, field installation, and system commissioning requirements. Compared to other options they know more, respond faster, provide more service and understand unusual customer requirements. DISADVANTAGES – Good ones make you work harder to provide more up front detail about the application, incoming power, and customer requirements before they will quote and submit. Their primary business is distributing parts so their primary interest is selling the parts they distribute. Some sell brands that are not well known so they will offer to assemble control panels to expand their parts sales. ADVANTAGES – They can be the cheapest option because they’re assembling control panels to sell the parts. DISADVANTAGES – Some don’t know enough to provide great service. Compared to other options they have the least controls knowledge so you have to be clear about what you want. Most don’t have dedicated design and production personnel so their quality can vary. Their primary business is installing electrical equipment and the wiring systems that interconnect them. When control panels are required some use local panel builders and others construct control panels as required. Some do it to control quality and others do it to expand their business. ADVANTAGES – They can be a low cost option because they’re building control panels to expand their business. Good ones understand applications, production and system commissioning requirements. DISADVANTAGES – Some don’t produce control panels regularly so they don’t have people dedicated to design and production. Some use outside contractors for panel design and electricians between field assignments for panel production so design and panel quality can vary. Their primary business is implementing new control systems. If their focus is software, control panels aren’t always a requirement. When required some use local panel builders and others build panels in-house. Some do it to control quality and others do it to expand their systems business. ADVANTAGES – They can be a good option because they understand control applications and system commissioning requirements. They provide good service and are used to unusual customer requirements. DISADVANTAGES – Some don’t produce control panels with enough frequency to require dedicated people for panel design and production. Some use an outside contractor for panel design and field technicians between assignments for panel production so design and panel quality can vary. Their primary business is producing equipment for their selected markets. When control panels are required some exclude them, some use local panel builders and others build control panels in-house using in-house personnel. 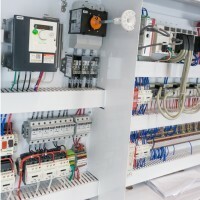 Most electrical control panel manufacturers focus on one of three basic market types. Each includes a set of typical applications and requires an investment to be understood, so it makes good business sense to focus. Some control panel manufacturers are capable of serving multiple markets well, but they’re rare. Process Control – Applications where process instrumentation (Level, Pressure, Temperature, pH, etc.) and process equipment (Pumps, Blowers, Valves, etc,) is used to control fluids (Liquids, Air, Slurries, Powders, etc.) in an industrial process. Machine Control – Applications where machine automation sensors (Position, Speed, Pressure, Temperature, etc.) and machine automation equipment (Conveyors, Actuators, etc,) is used to control solids (Sheets, Blocks, Boxes, Tubes, etc.) in an industrial machine. Building Controls – Applications where building automation sensors (Fire, Security, Temperature, etc.) and building automation equipment (Fire, Security, HVAC, etc,) is used to control the operation of a building.